Anna Maria Padula and Marcella Turazza give their thoughts as to why Italian universities are adopting a more American-style approach to student life in terms of a communal living environment. Due to the high number of foreign students, a multi cultural urban space proves not only to be the most logical and practical option, but also offers a more inclusive approach to student life, allowing students to focus more on their studies. Omni Admissions on Capital 4.0: What does a ranking really say? Within the cover story of the magazine “Capital 4.0” about universities that most easily guarantee a job position, Anna Maria Padula and Marcella Turazza warn about the value of rankings: it could be a helpful starting point, but it must not be the only criterion used when choosing a college. There are many variables that influence the position of an institution in a ranking, and not all of them are based on its academic value. Anna Maria Padula and Marcella Turazza answer some questions to help students prepare for an academic experience abroad. Students should show an excellent command of the English language (for courses taught in this language), but at the same time they should not be intimidated by tuition costs and bureaucracy. The New York Times selected 5 insightful college essays written by high school students that talk about their first work at age 11 to help sustain their family, their enthusiasm in helping the elderly and low-income people with tax returns and their perception of the differences among social classes. See the list of universities all over the world where our students have been admitted. Anna Maria Padula and Marcella Turazza talk about their idea to found their counseling company to broaden the opportunities for Italian students and support them through the application process to universities abroad: first-hand knowledge, assessment from the very first years of high school and a personalized plan for each student are the keys to a successful path. Anna Maria Padula, Co-Founder of Omni Admissions, shares her advice for university students who would like to broaden their career opportunities: living an academic experience abroad is an added value that opens doors to a successful future. Google debunks the belief that hard skills are the key to future success: two studies reveal that soft skills are more important than STEM expertise to succeed in today’s workplace, even in tech job positions. A long and complete overview to help students selecting the best university abroad considering the subject they want to study, admission procedures, and fees. Studying abroad and its costs are topics of great interest. 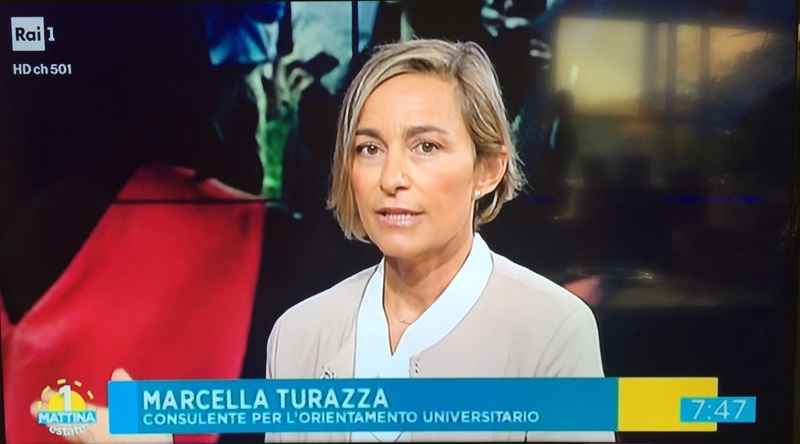 Marcella Turazza, Omni Admissions Co-Founder, and International Education Consultant has been interviewed on these themes by a national television network. Watch the interview using the following link http://www.raiplay.it/video/2017/08/Unomattina-Estate-11144f27-4fe0-460b-97a5-088534491232.html at 30’ 35’’. Io Donna interviews Omni Admissions on trends and procedures for the increasing number of Italian students who choose universities abroad. Among the most selected destinations, there are UK, Spain, France, Switzerland, and the USA. Here the stories of Francesca, Allegra, and Alice who decided to rely on Omni Admissions's experience to reach their academic goals abroad. US and UK universities are still leading. The positions of top universities remained almost the same, while four of Italian universities ranked among the finest universities in the globe. Ivy league colleges find particularly compelling students’ practical achievements rather than theoretical success as fitting summer activities in their highly selective admission process. They look for the students who have improved their ethics through the opportunities they have taken. Once again, many colleges reported a record-high number of applications for the class of 2021. Yale University reported a record-number of applications to the class of 2021, with 32,891 students applying with an admission rate of 6.9%. It's the university application season - with the first wave of deadlines, including Oxford and Cambridge, coming this week (Oct 15). For some of the most competitive courses there are also interviews. Oxford, keen to demystify its admissions process, has published the type of questions students might face and suggestions for how students might have answered. In an attempt to make it less intimidating the university has produced a video explaining how the interview works. The government has announced that EU students applying for a place at an English university or further education institution in the 2017 to 2018 academic year will continue to be eligible for student loans and grants - and will be for the duration of their course. Planning a visit to British universities? Published at the recent World Economic Forum meeting in Davos, The Future of Jobs report analyses how the fourth industrial revolution will cause widespread disruption to business models and to labour markets over the next five years, with enormous change predicted in the skill sets needed to thrive in the new landscape. The report concludes that a combination of demographic changes and technological advancements is likely to lead to the net loss of 5 million jobs by 2020. The report estimates that c7.1 million jobs could be lost, the majority of which will be white-collar office and administrative jobs, but that there will be growth in some job categories. The third edition of “Study in the UK” Fair is taking place in Milan on Saturday 27th February 2016. A great opportunity for students interested in studying in the United Kingdom to meet 30 British educational institutions offering undergraduate, postgraduate and English language courses. Entry is free. Online registration is required. US college admissions: Harvard says "Time to change"! A new report released by the Harvard Graduate School of Education, entitled Turning the Tide: Inspiring Concern for Others and the Common Good Through College Admissions, takes a major step in trying to change the college admissions process to make it more humane, less overachieving. The Common Application has announced that the 2016-2017 personal statement essay prompts will be the same as the 2015-2016 prompts. Moreover, student accounts created now will roll over to 2016-2017. With a 2% increase in applicants, UK universities courses are more competitive than ever before. See details by region in the attached document. For the first time ever, US college acceptance rates dropped as low as 5.05%. Find some important facts and figures in order to understand the trends in admission. The second edition of “Study in the UK” Fair is taking place in Milan on Saturday 28th February 2015. A great opportunity for students interested in studying in the United Kingdom to meet 35 British educational institutions offering undergraduate, postgraduate and English language courses. Entry is free. Online registration is required. With the support of a charity, Justus had the chance to start his studies and to leave the hard life in the biggest garbage dump of the Rwandan capital Kigali. Nowadays Justus is one of the 25 students from Africa enrolled at Harvard University thanks to a full-scholarship. He is an example of the potential hidden in humanity’s most hopeless places. Brennan Barnard , director of college counseling at The Derryfield School in New Hampshire, assembles a summer reading list for parents and students with the suggestion of college admissions deans and high school counselors. The New York Times publishes an article on the growing tendency among students to use in their admission essays unfiltered frankness, describing the most intimate corners of their lives. This is not a winning strategy to grab attention from Admission Officers. Because of the growing esteem of the International Baccalaureate program, many UK universities have lowered their entry requirements for IB diploma candidates. There is a increasing belief that the IB better prepares students for a thriving college experience and a successful professional life. This year was extremely competitive entering Ivies. Princeton University, University of Pennsylvania, and Cornell University have recorded their most selective admissions classes ever. Other Ivies saw their acceptance rate rise from last year. Volunteer experience enriches the personal resume and reveals passion and organizing skills. When students open their SAT test books in spring 2016, they’ll encounter a SAT that is more focused and useful than ever before. The full specifications of the exam along with extensive sample items for each section will be available on April 16, 2014. Major changes are described below. Financial Times publishes the 2014 world MBA rankings and related salaries of graduates after three years. Il Sole 24 Ore offers a deep study on the strategy to follow and the steps to undertake in order to get ready for university abroad. It includes a direct contribution by Omni Admissions. Pros and cons of deciding to study in a boarding school. Corriere.it helps the reader to better understand this very current topic. The number of Italian students moving to English schools to obtain an International Baccalaureate is growing. The trend involves difficult choices from an emotional and academic point of view and requires a great level of awareness. IELTS (International English Language Testing System) scores are accepted as qualification of English language abilities by universities in the UK as well as other countries such as Australia and Canada. (You should always check with each university you are applying to about which tests they accept.) Remember to register 10 days before! The SAT is a college entrance test for American universities and is becoming more widespread as a requirement to apply to European university programs taught in English. Remember to register at least one month ahead. You can find all the information you need in the SAT section of the College Board website. The TOEFL (Test of English as a Foreign Language) is an English language test used for college admissions by US universities as well as many European universities. Remember to register at least 7 days before! How to choose the best university abroad? Choosing the subject is the first step. Because every university abroad is well-known for a specific subject. HIGHER RETENTION OF FOREIGN STUDENTS IN US? The current U.S. visa system makes it challenging to retain foreign students, but new proposals could change that. The number of foreign graduates in science, technology, engineering, and mathematics (STEM) from American universities working in the United States could increase dramatically. This preliminary analysis offers some evidence on the possible effects of those proposals by examining the size, characteristics, and geographic distribution of foreign students in the United States. The SAT is a college entrance test for American universities and is becoming more widespread as a requirement to apply to European university programs taught in English. 2013-14 sessions have been approved and it will be soon possible to register online. You can find all the information you need in the SAT section of the College Board website. FROM MILAN TO YALE. WITH A SCHOLARSHIP? The only Italian student admitted to Yale University this year is finishing his fifth year at Liceo Scientifico (Scientific High School) Volta in Milan. More than ever, American universities are pursuing students who are appealing not only from an academic standpoint. This certainly helped Simone Paci to be part of the 6.7% of almost 30,000 students who applied to Yale. While the university met him partway with tuition, his main challenge now is finding a scholarship to cover the fees. Details from Il Corriere della Sera. ONE ITALIAN STUDENT ADMITTED TO M.I.T. The only Italian admitted to the prestigious Massachusetts Institute of Technology this year is a student at Liceo Classico (Classical Studies High School) Galvani in Bologna. The key was his steady determination since early high school to attend university abroad. Details of Emanuele’s experience from Il Corriere della Sera. U.S. policymakers have put forth various immigration reform proposals to improve retention of foreign students obtaining advanced degrees in science, technology, engineering, and mathematics (STEM) from American universities. The online magazine Brookings analyzes the issue. The eight private American universities that make up the prestigious Ivy League recently made public the admissions data of the Class of 2017 (students who will start college in August 2013). With the exception of Dartmouth College, the admissions process was more selective than ever, with Harvard, Yale and Columbia Universities admitting less than 7% of applicants. More from The New York Times. Australian Education International data shows that the number of Italian students requesting student visas for Australia is growing. While the data also reflects students who are experiencing Australian secondary schools for three-twelve months, interest in universities Down Under is on the rise. The country boasts six universities ranked in the top 100 in the world. Il Sole 24 Ore examines the phenomenon and the best Australian universities. In late March and early April, American universities sent out acceptance and rejection letters to regular admission applicants. Many students are therefore having to make a difficult choice between different offers by May 1. The New York Times offers a “survival guide” to managing this sensitive phase.